If you have been on this blogging journey with me for awhile then you probably know I love a bold statement ceiling. 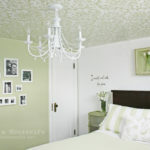 I stenciled my bedroom ceiling about 8 years ago and have been obsessed with ceilings that have extra style ever since. I have compiled some of my favorite examples of statement ceilings for you. I’d love to hear what your favorites are! 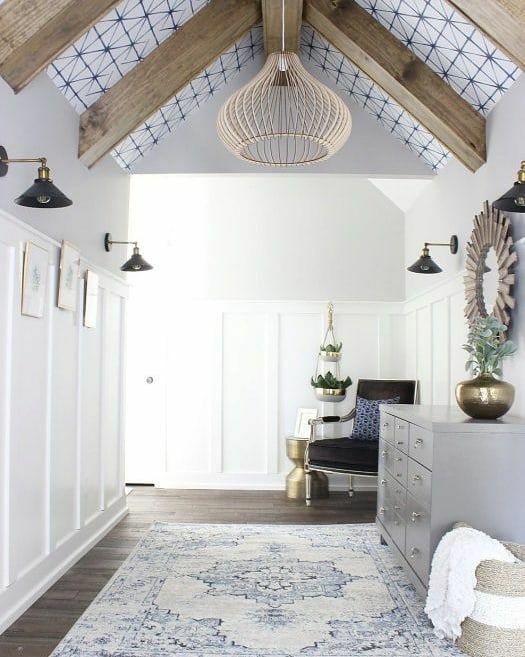 Black shiplap on the ceiling draws the eye toward the focal point of the room. 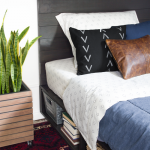 It makes this space so cozy too. 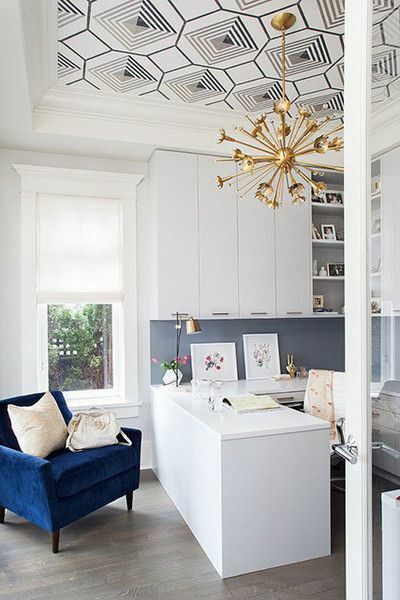 Custom decorative molding paired with a gorgeous blue gives this otherwise neutral office a huge wow factor! Stunning is the first word that comes to mind when I see this marble bathroom. 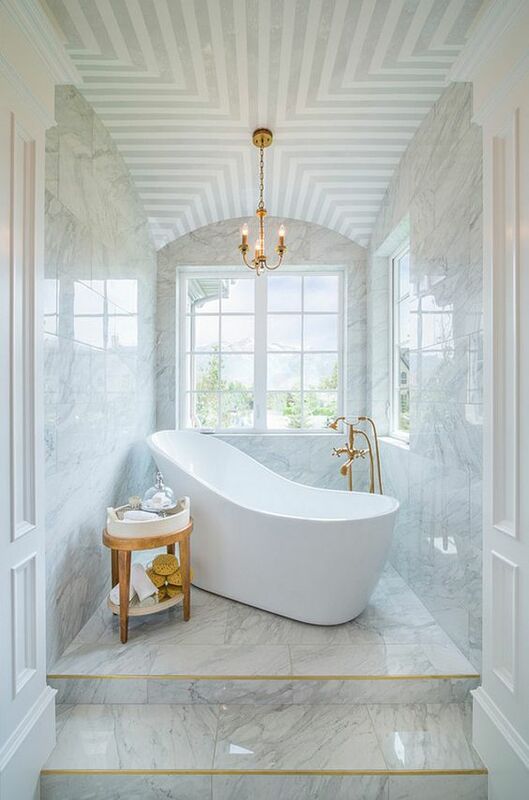 Can you even imagine soaking in this tub and staring up at this gorgeous ceiling? 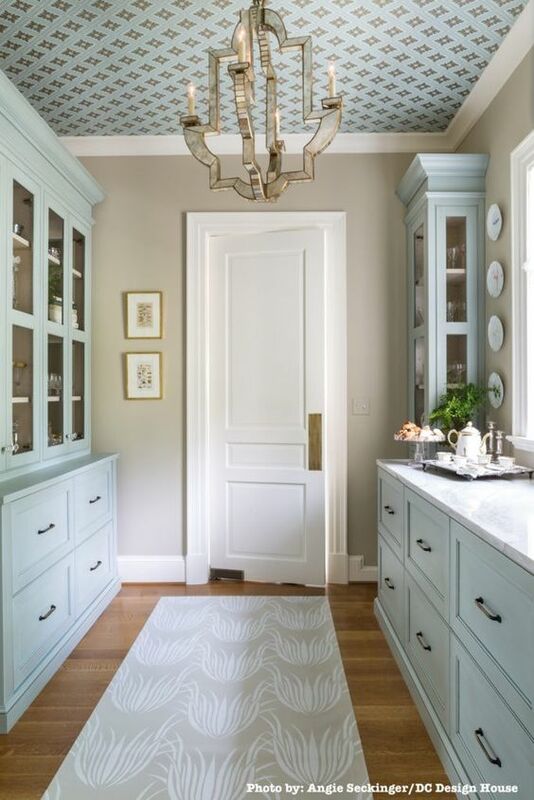 This mostly white room benefits from the fun geometric pattern on the ceiling. It completes the space! I have always love black and white checkered floors in kitchens. 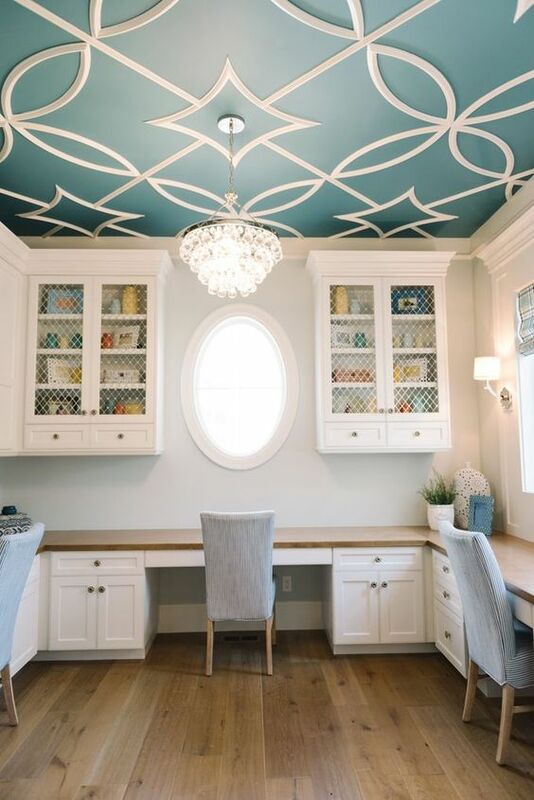 When I decorated my kitchen and dining area, I decided to add that pattern to my ceiling instead! 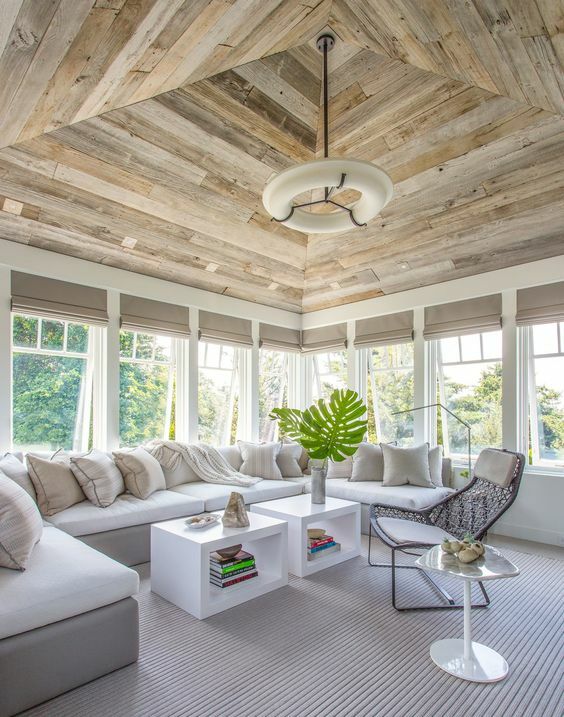 This reclaimed wood ceiling over this porch is warm, rustic, and pure perfection. 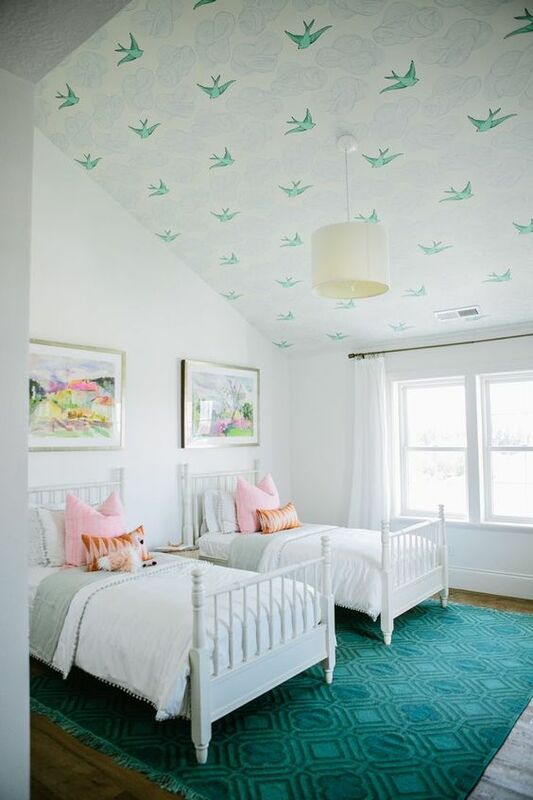 How sweet are these little birds on this little girls room? 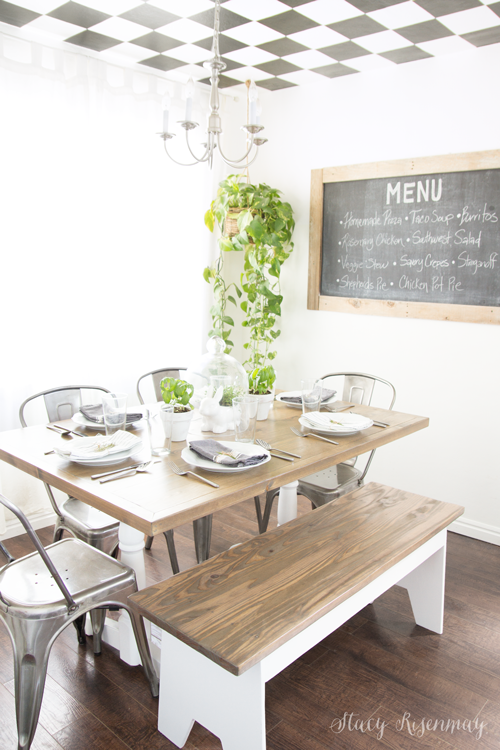 The wallpaper gives a bit of whimsy to this precious space. 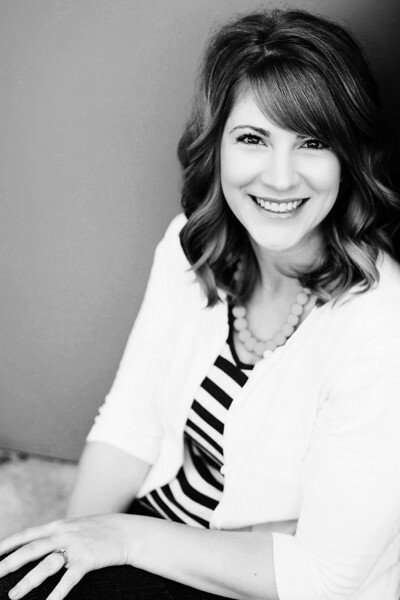 Black and white pair with rustic wood tones will always be a favorite combination for me. 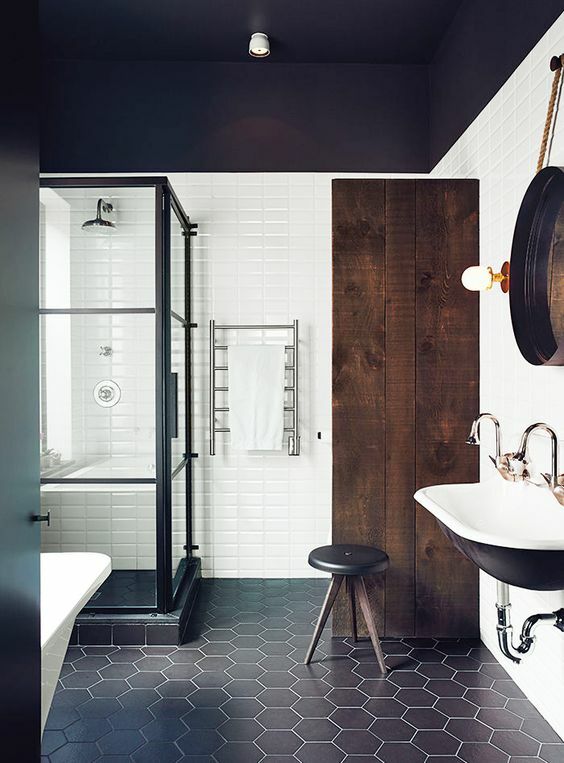 This dark ceiling gives this modern bathroom some drama and I love it! 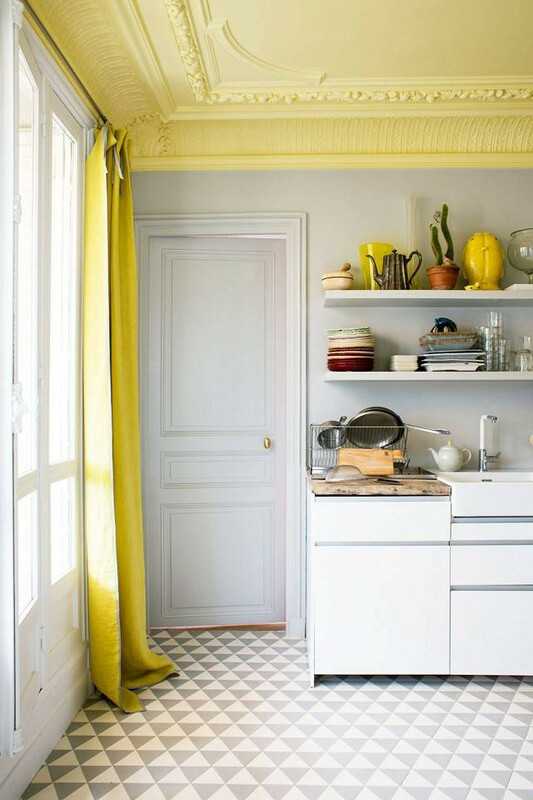 Yellow may not be the first color you think of, but this buttery goodness looks great in this charming kitchen. 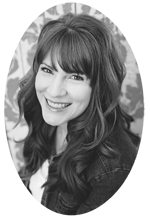 Wood beams and wallpaper have never looked so good! They bring so much visual interest to this little nook. There isn’t any drywall in our unfinished part of the basement right now. We have floor joists showing that look similar to this and after seeing this photo, I want to keep it that way and paint them black! This of all the colors and patterns you could add to a playroom ceiling! The possibilities are endless. I love this blue sunburst. A kids spaces is the perfect place to experiment with a fun ceiling. 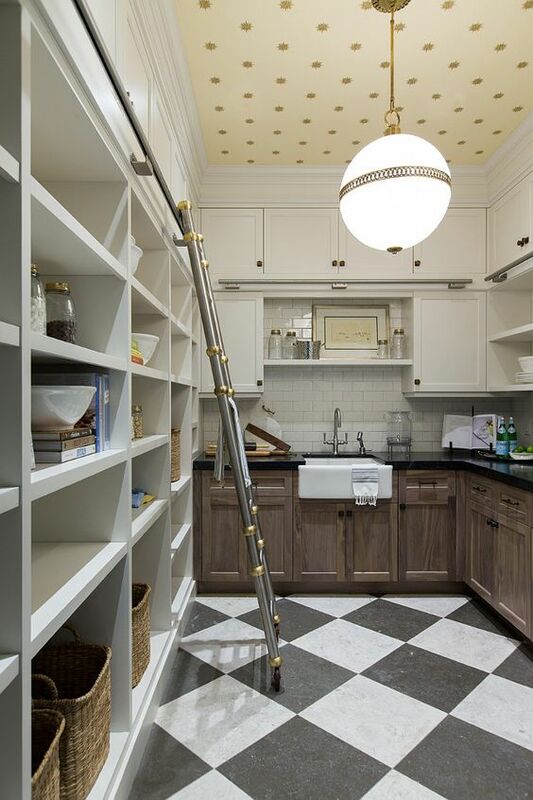 This space would still be pretty without the statement ceiling. But the wallpaper takes it to a whole new level! 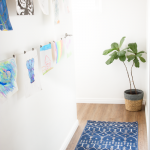 Here’s another example of a space that would be beautiful (and still end up on my pin board) without the wallpaper, but it is so much more with it! 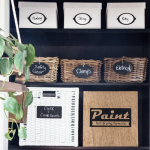 Have you experimented with painting, planking, or wallpapering your ceiling? I’d love to hear if you have, and which of these statement ceilings was your favorite. I painted our family/media room ceiling black and the living room ceiling yellow. I love them both! You probably put the idea in my head with your kitchen ceiling. 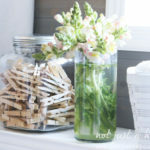 I love these pictures and want to do our bathroom ceilings with cedar planking. 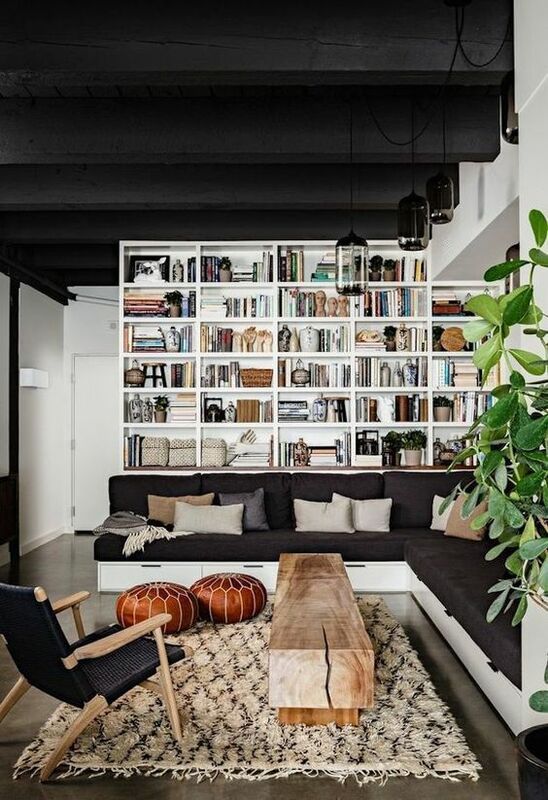 Black would be perfect for a media room! And yellow is so cheery :) I am sad I had to paint over my stenciled ceiling but our new bedroom will have a fun ceiling too. I love your kitchen ceiling, my fave. For a porch, the reclaimed wood. Thank you! And that porch makes me wish I had a covered porch to cover in reclaimed wood. It is gorgeous! 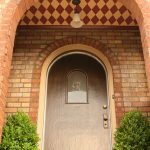 Had a Victorian house and custom painted the upstairs hall in navy. Used navy, gold, and the light wall color to fake some crown molding. Then on the ceiling navy I used vinyl stylized stars in gold. It really imitated the navy and gold wallpaper from fancy Victorian images but for waay less than reproduction wallpaper. That is awesome! I bet they all looked amazing. That sounds so charming Danita! I hope you find the perfect wallpaper. I grew up in a room with a sloped ceiling as well and I think that is partly what drew me to that image. I’d love to see pictures when it is done! I have a sloped ceiling in our master bedroom too. 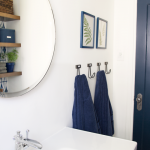 We painted the walls and ceiling a pretty sky blue that makes it feel very open and airy, but this post has me wondering if I could do something more interesting too. Ha! I really think that wallpaper works because of the light blue/cloud/sky thing too. Interesting.